For many organizations, Sarbanes-Oxley compliance is mandatory; both on the financial side and on the IT side managing the process can be an arduous an unwitting waste of time. Walkthroughs that need to be reviewed by numerous individuals, tens of controls that need to be sampled and tested in detail can come with time lags that makes an already detailed task more cumbersome. Automating the self-assessment process can make it less painful if performed under proper supervision. There are many advantages to using a GRC tool to automate assessments such as speed, efficiency, data integrity, and improved analysis. 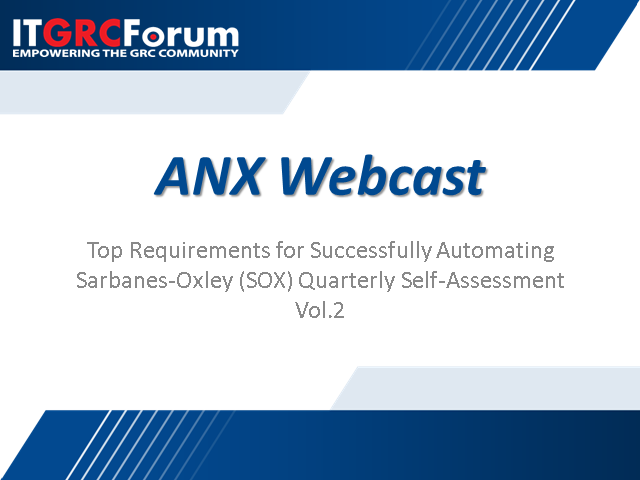 Join Salman Aziz, ANX's President Risk and Compliance Services domain expert, in this 1-hour live webcast, where he will uncover the top automation requirements organizations should consider to successfully automating SOX quarterly self-assessments. Colin Whittaker, IRD; with panelists from: BitSight. OneTrust, and ProcessUnity. The current state of vendor risk management (VRM) is bleak. More than half of all information security breaches are caused by third-party vendors, and according to Deloitte 83% of today’s business leaders lack confidence in third party VRM processes. Given the growing complexities in accurately collecting and screening third-party data and the need for deeper due diligence, automation is key to a successful risk program. However, many corporations haven’t adopted automation in their third-party risk management programs. -Drive efficiencies and reduces costs, while ensuring the highest accuracy in your third-party risk management program.